Driving past the kitschy Juhu Tara Road with its Bollywood billboards, we almost miss Aurus. An arrow points to the place on the ground floor of a nondescript building. As we enter the doors, the restaurant opens into a Miami-like scene inside—not the Miami of South Beach but more its lesser known cousin, Little Havana. The sleek sofas were covered in colour-drenched jacquard. Gilded mirrors and chandeliers are in plenty. The moustached waiters with gelled hair and printed silk shirts usher us to the main dining room where we are greeted by Chef Vicky Ratnani. As we sank into the grey silk paisley chairs, Chef Ratnani announced the gustation menu of small plates with pairings. Our palates were gently nudged by the opening Cola Caviar with Celery Bonsai. So softly did this pair with the Sula Brut that we started speaking in whispers. A rose wine and a Sweet Beet Carpaccio created a riot of colours offset by a flurry of basil snowflakes. Organic salad dressed in pear vinaigrette followed in mini martini glasses. My friend remarked that the salad looked like overflowing tightly corseted ladies! 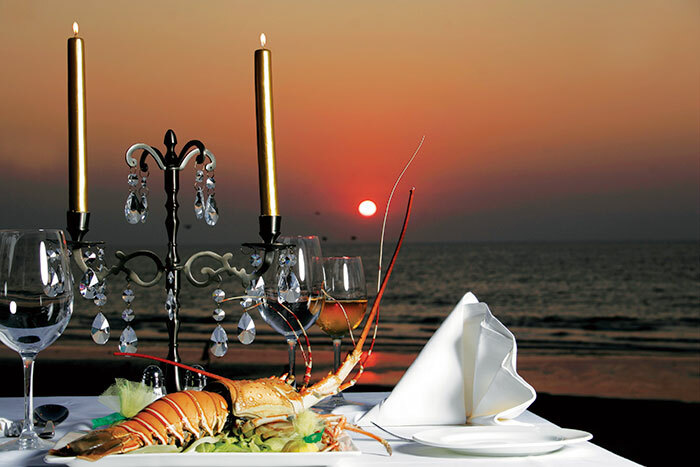 Sensing our mood, Chef Ratnani suggested we take a walk by the beach before the main entree. Stepping to the exterior of the restaurant and into the cabanas and the sands, we looked at the twinkling lights of houses at the far end of the beach wondering if the people there were having as good a time. The entrees had arrived so we returned to the table. The first one was a grilled line-caught snapper paired unusually with a Belgian beer, the hearty fish complemented beautifully by the crisp bittersweet beer. Then came the Malbec in all its robustness with a medium rare lamb and Lychee-Glazed Lobster. The accompanying Coco Asparagus and Red Pepper Steak Sauce created spirals of intense flavours around the lamb, and the lobster – a little too complicated. Suddenly it seemed like too many elements were thrown in to create a crescendo. Just as we thought we could take no more, the sweet platter was upon us. A Chocolate Fondant, a chocolate dipped passion-fruit lollypop and Roquefort cheesecake came together like impossible African Lladro dolls. La Dolce Vita. We were in heaven. 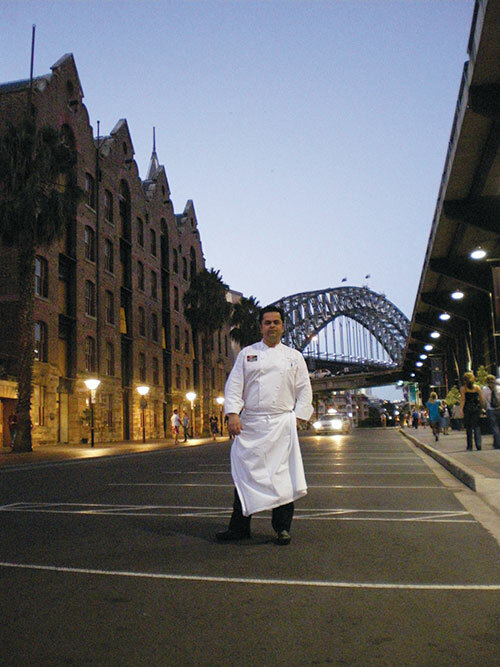 Chef Ratnani is committed to using local produce. Despite his many challenges, he has managed to use ingredients from neighbouring farmlands, local poultry and fish from the Mumbai docks. As we were leaving, the cubanesque waiter politely opened the door flashing his gold bracelet. I wanted to ask him just one last question. Pase los cigaross? Chef Giancarlo, Head Chef at the Four Seasons Hotel in Worli, Mumbai invites us to come and meet his pastry crew headed by Chef Thierry Metee. Passing the service elevators, loading docks and gigantic laundry rooms, we reach the basement pastry kitchen. Almost instantly, the aroma of baked vanilla beans transported us to wonderland. Pastel macaroons, black and white ice-creams and mango crème brûlées brought a touch of colour to the chrome and stainless-steel kitchen. 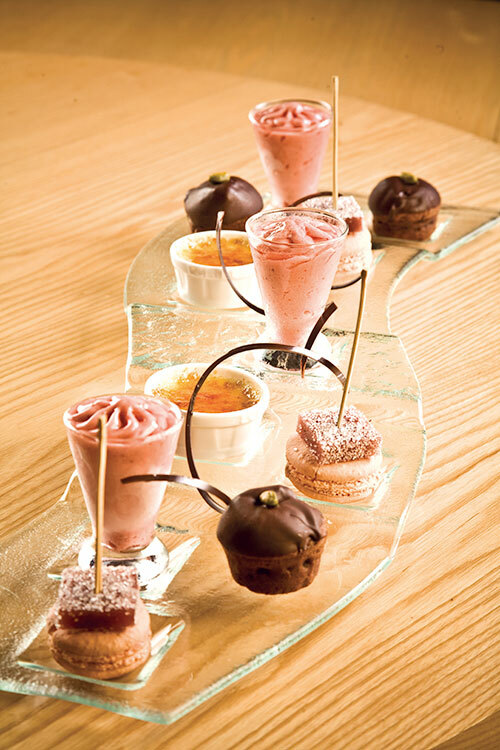 Chef Thierry’s pastries are cooked in an uncompromising French tradition. He uses only the best ingredients—butter from France, chocolate from Europe, the best brown eggs from Delhi and kazi lemons in season from the North East. Strawberries and raspberries come from the hotel owner’s farm. However, once the basic techniques are set, the chef takes a break from tradition and combines Far-Eastern influences like sesame with ice-cream and mango with crème brulee. The Black Sesame Ice-cream brought back memories of the days when we ate bittersweet sesame-balls laced with jaggery at granny’s house, only the White Sesame ice-cream was creamier, milder. The green tea icecream complementated the pannetonne beautifully and we were ready to catch the last bus home. 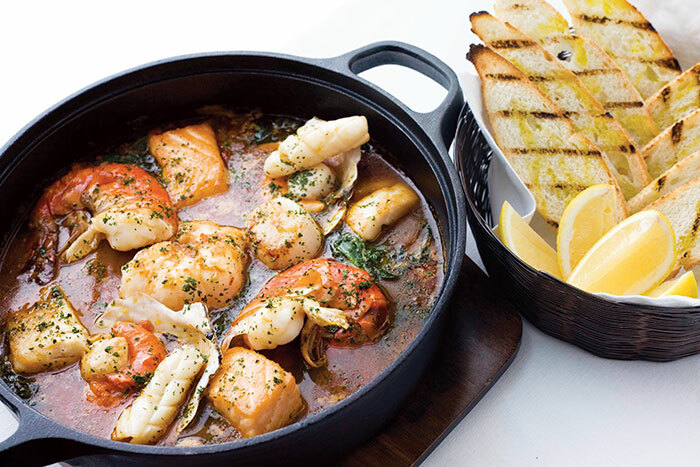 If you’re looking for an unassuming little trattoria that serves familiar fare like spaghetti with meatballs, stay away from CIBO, the culinary brainchild of designer Rohit Bal and Alok Aggarwal (of Veda fame). The magnificent if somewhat flashy new ristorante located inside Janpath Hotel’s premises compels you to notice it (flamboyance and Bal go together like Parma Ham and Manchego) from the moment you walk through its massive antique Italian door. The spacious courtyard evokes the grandeur of Renaissance Italy with its gigantic statues of Roman Gods in gold-leafed marble, the grape motifs adorning the walls, a giant grapes sculpture and spectacular cascading waterfalls. Feast on pizzas made in an outdoor clay oven in the patio or pastas from the live cooking stations. The huge space is perfect for live events. The grand finale of the Delhi Fashion Week in March—Bal showcased his Autumn/Winter-2009/2010 collection here—was an extravagant affair. 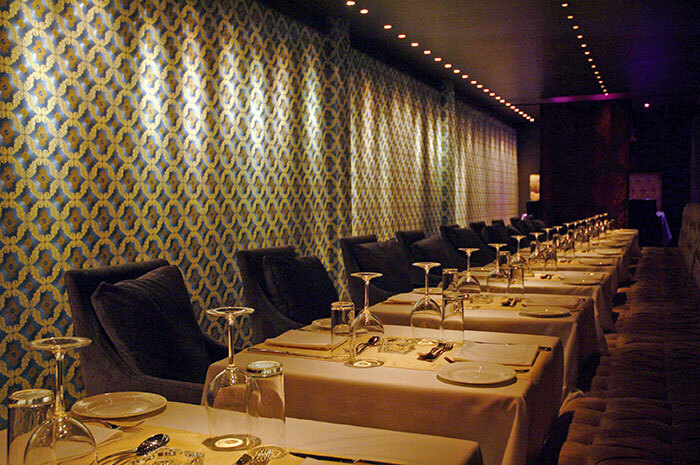 The inner part of the restaurant, done up in shades of blue, black and gold, suggests a mood of baroque luxury. Private dining rooms are a thoughtful touch for large gatherings. The food complements the lavish decadence of the place. 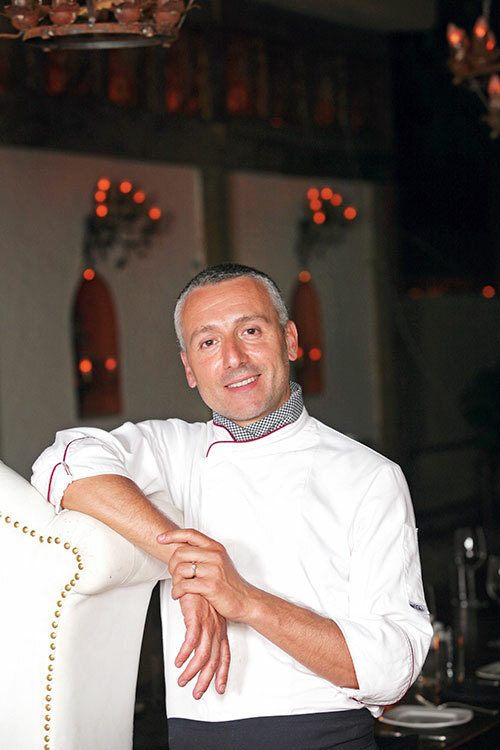 Chef Andrea Sposini, a graduate of Scuola di Arte Culinaria Cordon Bleu di Roman works with authentic ingredients creating a menu featuring traditional dishes from villages across Italy. The five-course meal—Antipasti, Primi, Secondi, Contorno and Dolce—provides an experience of an old-world meal in a spectacular space. “The idea is to keep the food simple, not too complex. 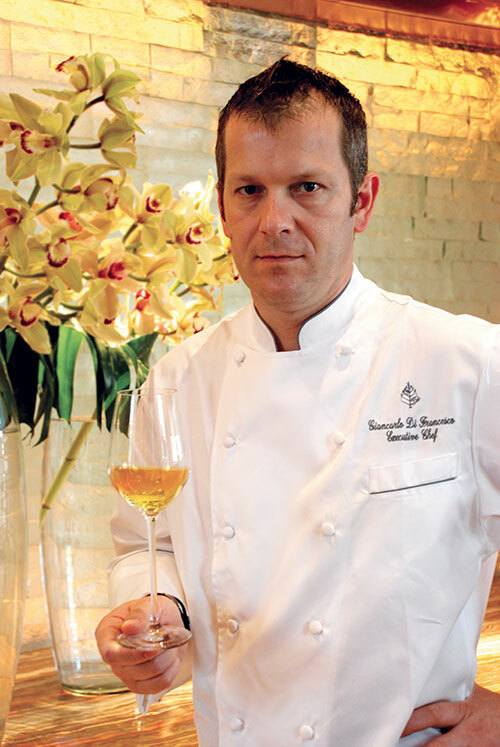 I don’t want to change the dishes to Indianise, or experiment with fusion too much.” says Sposini. The fresh homemade pastas are the best part of the menu. Choose from lasagne, gnocchi and risotto. 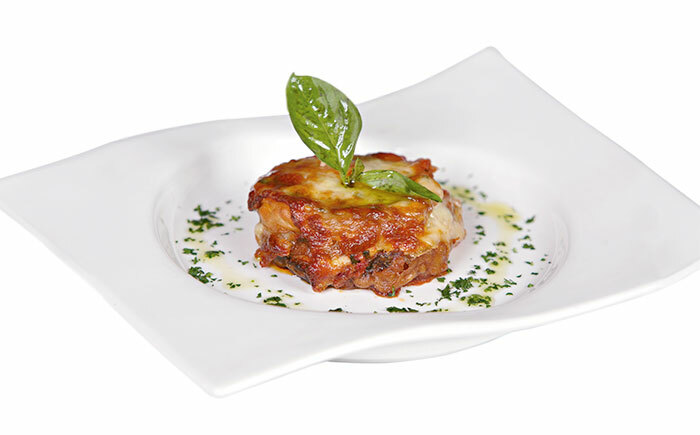 We recommend the Tortelli di ricotta burro e salvia and the Lasagne alla Boscalgliola. The skewered jumbo prawns are great from the meats section. Among salads, try the Insalata di Fagioli Bianchi, a delicate salad made of black-eyed beans (si, the humble lobhiya has exciting global possibilities), onions and sage. The chicken salad is refreshing in its use of boiled instead of grilled chicken (an authentic Italian touch). Alas, you’ll have to wait for that glass of Barolo to accompany your meal as the restaurant is still in the process of putting its liquor license in place. But this will probably, hopefully, be remedied by the time you read this. Bon Appetitto! 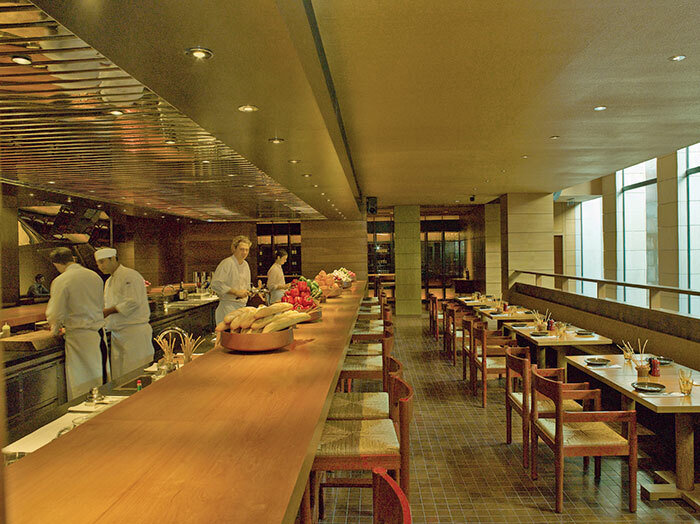 The newly opened Aman New Delhi brings the exciting experience of tapas and Catalonian cuisine to India. With its bustling expat population, growing cosmopolitanism, ongoing culinary and cultural revolution–not to mention the Commonwealth Games that are just around the corner–Delhi is more than ready to say Viva España. 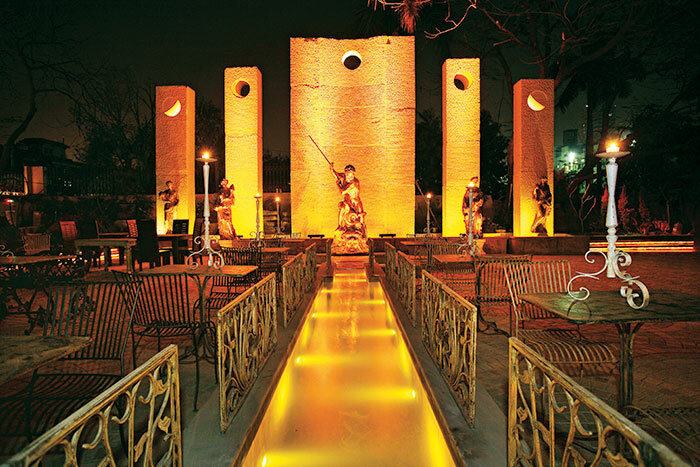 The Lodhi, a three-level dining venue framing a reflecting pool, features Catalonian food on the entry and second floor and a lower-level tapas lounge. 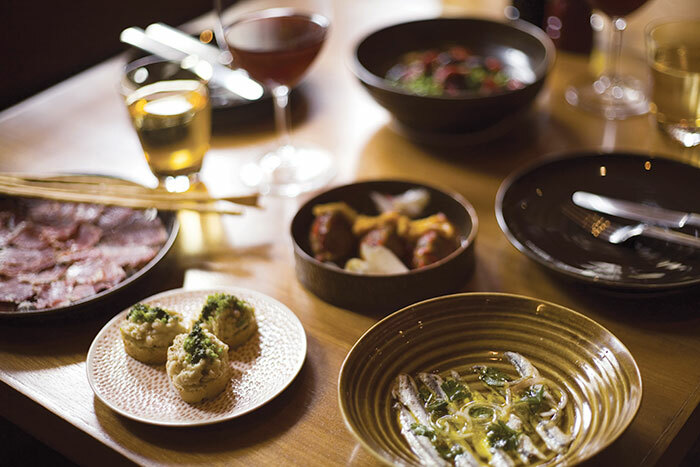 The bar offers an informal, intimate way to meet with friends or schmooze over glasses of sangria or fino (sherry) and delectable tapas, the quintessential Spanish aperitifs. Served as pinchos, literally meaning a pinch on a stick, the cornucopia of treats includes Escalivada (a salad of bell peppers, onion and eggplants on sour dough bread), tomato bread, garlic chicken skewers, mixed croquettas of ham, chicken and mushrooms and garlic prawns among others. Sip, nibble, chat and have the perfect tapeo experience. After tapas, it’s time to head upstairs for the main course. 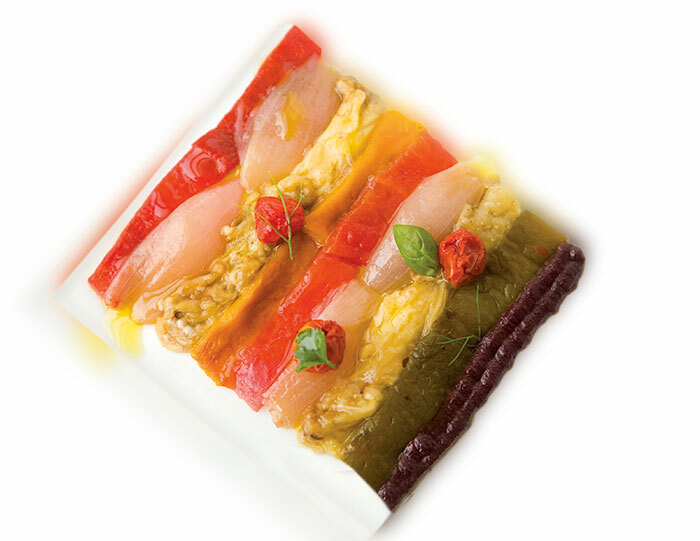 Unlike Italian and Thai, Catalonian cuisine is a novelty for the Indian restaurant landscape. Known for its balance and variety, it dates back to the time of the Romans combining influences of Italian, French, Greek, Provencal, Arabian and Jewish gastronomy. The superb food and wine/sherry pairings at Lodhi coupled with the tranquil ambience make for a distinct and fresh dining experience. Our fresh figs, Serrano Ham and young leaves salad and the seared foie gras with pickled plums work brilliantly with Txakolina ‘Getriako’, a young and fruity white wine. The entrées of Spanish Bomba Rice (a unique rice variety from Spain that expands horizontally on cooking! ), Asparagus, Peas and Chives and Rack of Lamb, Baby Eggplant and Pumpkin Gnocchi, paired with a full-bodied Spanish Pinot Noir called Bassus, are quite good, too. East India Solera sherry from Jerez is a must-try, not just for its delicious decadence but also for its fascinating history. In centuries gone, casks of sherry were lashed to ships sailing for the Indies as a ballast and were found to develop an extraordinary smoothness and complexity. A journey in every sip!